Pojo's Unofficial Dragon Ball Z - Book 3. Pojo's Unofficial Absolute Dragon Ball Z - Cards Simplified has everything you're looking for in a new DBZ title. You can order from PC right now from Amazon.com! It's 96 pages, and jam-packed with the goods and great card images of uber rare cards! Jesse Zeller provides a basic explanation of what types of cards there are, and what they do. 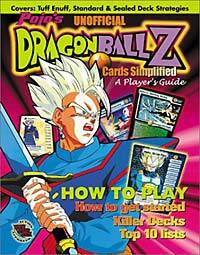 IQ has a brief history of the Collectible Card Game, and a history of tournament play. Not sure where to start or what to buy? We’ve got a few details for you here. Jesse Zeller has some tips to building a winning deck. Sealed Deck tournaments are a fun change of pace from preconstructed events. We explain how to play, and provide some deck building tips. Huge Dragon Ball Z Tournaments take place year round. We explain what they are, and why you should participate. We look at the Top cards from every set printed through the Babadi Saga. Some people aren’t players. They are just collectors. Here’s a list of what we think are the best cards to add to your collection. Pick one up today at Amazon.com!